The fog this morning was as thick as a good roux. I have been wanting to try my hand at photographing isolated oak trees in morning fog, so I jumped in the car and headed out. I wasn't having much luck finding the right trees in the right setting and I didn't want to drive too far away from home, so I headed to Lake Martin, naturally. I walked to the end of the point and stared into nothingness. I could not tell where the water ended and the air and fog began. It was a very weird feeling. To the left of me were the trees that dot the shoreline. The air was very still so the water was smooth as glass and the trees' reflections were unbroken. The effect was that of a Rorschach inkblot test. I think my favorite shot of the morning was of the little tree that lives at the point (shown above). The stillness of the air was broken only by the flapping of birds' wings and splashing of fish and fowl. I always enjoy witnessing daybreak at the lake. I left the launch area and headed down the road toward the boardwalk. I stopped across the street from the farmhouse with the cows and wandered over to the water's edge. A great egret was stalking its breakfast and had no problem with me being there. In fact he moved a bit closer during his pursuit. I keep my camera in my car with my "everyday lens", which would work for landscapes. I didn't take my 500mm lens with me because it was with the rest of my equipment in my bedroom and I had wanted to sneak out without waking my husband. So of course, I had plenty of photo ops with a mere 28-135 lens! Not only could I have gotten some great closeups of this egret, but while I was standing there a beautiful red-bellied woodpecker decided to play around in the tree above me. I still don't get why it's called a red-bellied woodpecker when the head is red, not the belly! Then I saw a little bluish-gray, finch-like bird land in the duck potato plants growing in the water directly in front of me. He flitted around for quite some time, obviously aware that he was taunting me. Tonight I saw that a fellow photographer took some shots of the same kind of bird and identified it as a blue-gray gnat-catcher. I'll have to go back and get some shots of my own. I hated to leave, but I knew that I had to. I could have spent all day there. It was in direct contrast to the craziness I had experienced Saturday at the mall when I attempted to do some Christmas shopping. I'll take the lake over the mall anytime! 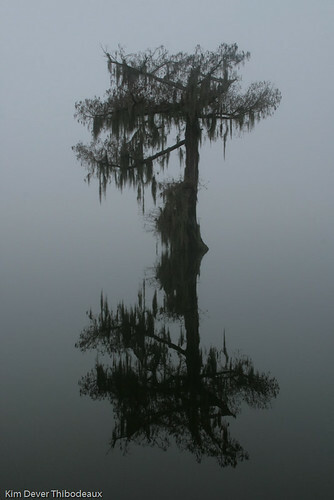 If you like these photos, you can click here to see more photos taken at Lake Martin, part of the Cypress Island Preserve in Breaux Bridge, Louisiana. Awesome ... perhaps especially to a fog loving person like me. Saint John, NB ... where I live, is being referred to as the Fog Capital of Canada. 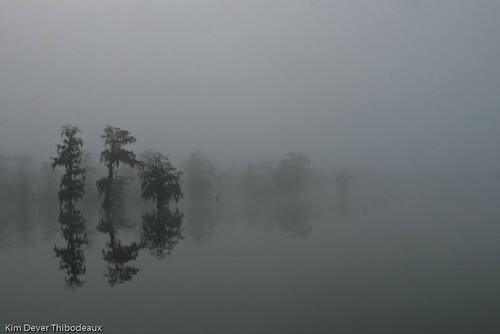 I love to be out in the fog ... the feeling of ... 'embeddedness' and everything is so quiet. I have a favorite lake where I .. Lily Lake.